You can create your account today through Saturday 1 June, 2019 11:59 AM, ChST. Judges and stewards may register now through Saturday 1 June, 2019 11:00 AM, ChST. You can add your entries to the system today through Saturday 1 June, 2019 12:00 PM, ChST. Each entry will be required to submit one 500mL or 750mL capped bottle or corked bottle that are void of all identifying information, including labels and embossing. Printed caps are allowed, but must be blacked out completely. Entry fee is $5 / entry + PayPal fees. 750mL brown PET bottles are preferred; however, brown and green glass will be accepted. Swing top bottles will likewise be accepted as well as corked bottles and aluminium cans. Bottles smaller than 500mL will not be accepted and judged, entry fees will be forfeited for such entries. All requisite paperwork must be submitted with each entry and can be printed directly from this website. Entry paperwork should be attached to bottles using an elastic band. Be meticulous about noting any special ingredients that must be specified. Failure to note such ingredients may impact the judges' scoring of your entry. Entry bottles accepted at our drop-off locations from Monday 27 May, 2019 8:00 AM, ChST through Saturday 1 June, 2019 12:00 PM, ChST. *Please check opening hours for Hoppy Days on their website. Drop off is strictly closing on Saturday 1st June 2019 when Hoppy Days closes at 4:30PM. Hoppy Days won't be accepting any drop-offs after Saturday 1st June 2019. Please check opening hours for Hoppy Days on their website. Drop off is strictly closing on Saturday 1st June 2019 when Hoppy Days closes at 4:30PM. Hoppy Days won't be accepting any drop-offs after Saturday 1st June 2019. Champion brewer receives a pro-am collaboration beer with Black Hops. Champion brewer will be determined based on an average score of each brewer's three highest scoring beers. To locate your judging numbers (random 6 digit number) login to your account (My Account > Entries) and view your entries. Note: Judging numbers won't be shown on a mobile device. You can then locate your score sheets below based on the judging number and the category. The awards ceremony will take place once judging is completed at the June Gold Club meeting. Both score sheets and awards will be available online within the competition portal. Score sheets will NOT be sent via. postal mail. 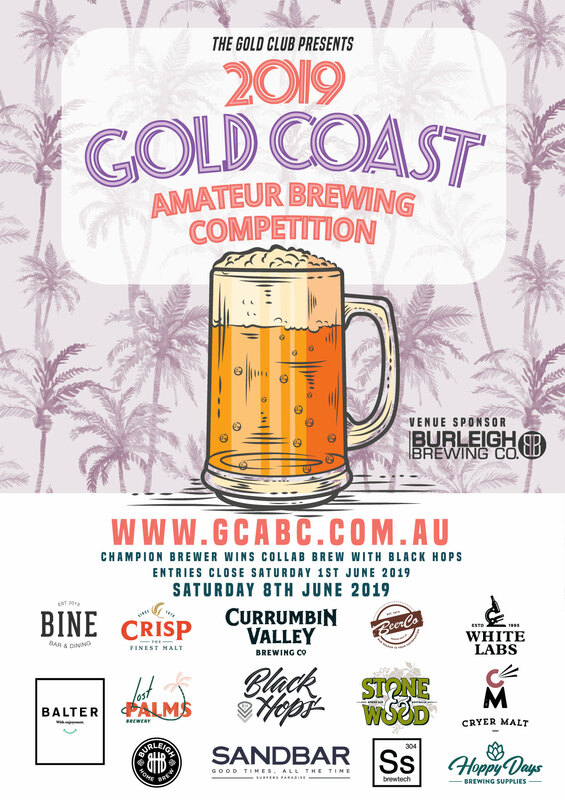 Awards will be available for pickup at the Gold Club meeting at Burleigh Brewing, details on this will be communicated with the prize winners individually. Results will be posted to the competition web site after the ceremony concludes.